Pope Francis has made a crusade of his quest to weaken the Catholic Church and the West with demands that illegal migrants and Muslim 'refugees' be accepted into western countries. Today, he singled out presidential candidate Donald Trump for special criticism, saying that if Trump planned to build a wall to protect America's southern border, he is "not Christian" according to the Associated Press. So here we have a presidential candidate actually promising to defend Christians, something Pope Francis has never actively done during his tenure as Pope... and this pontiff attacks him?? It's also worth nothing that not only has Trump repeatedly made the point that he favors legal immigration, but that most of the Republican candidates - Ted Cruz, Marco Rubio, Ben Carson, even John Kasich - at least favor increased border security, thus proving Trump's claim that this pope is being manipulated specifically against him. Given the billions of US dollars that flow across the border in the form of cash from expatriate Mexicans legal and non-legal, the Mexican government obviously has an interest in the status quo. And so does the Catholic Church. One thing that wasn't mentioned in the media was how much money the Church is getting from the Obama administration to' process' all these illegal aliens...a cool $9 million in addition to millions of dollars in existing grants and additional funds given by the Obama regime to the U.S. Conference of Catholic Bishops, Catholic Charities, and the Catholic Legal Immigration Network. What do you think is the goal of such groups in engaging in “dialogue” with Catholic bishops? The U.S. Conference of Catholic Bishops’ 2014 statement on “dialogue” quotes the 2007 document sent to the Pope and other Christian leaders, A Common Word Between Us and You. It is likely that not a single one of the bishops was ever curious about where the phrase “a common word between us and you comes from beyond the Qur’an citation provided in that document’s epigraph. If they had looked it up in the Qur’an, they would have found that the full passage is not a call for mutual understanding and mutual respect; rather, it is an exhortation to Christians to convert to Islam: “Say: ‘People of the Book! Come now to a word common between us and you, that we serve none but Allah, and that we associate no others with Him, and do not some of us take others as Lords, apart from Allah.’ And if they turn their backs, say: ‘Bear witness that we are Muslims’” (3:64). Since Muslims consider the Christian confession of the divinity of Christ to be an unacceptable association of a partner with God, this verse is saying that the “common word” that Muslims and the People of the Book should agree on is that Christians should discard one of the central tenets of their faith and essentially become Muslims. For groups such as ICNA and ISNA, that is almost certainly what the “dialogue” is all about, along with compelling Catholic leaders to remain silent about Muslim persecution of Christians, as when Robert McManus, Roman Catholic Bishop of Worcester, Massachusetts, suppressed a planned talk at a Catholic conference on that persecution, explaining: “Talk about extreme, militant Islamists and the atrocities that they have perpetrated globally might undercut the positive achievements that we Catholics have attained in our inter-religious dialogue with devout Muslims.” Evil works under the cover of darkness, and McManus, drunk on “dialogue,” was happy to supply that cover. But the typical modern Catholic bishop, coddled, cosseted, regal, arrogant, authoritarian, ignorant, self-infatuated, and utterly devoid of charity, will never deign to acknowledge any of this. They are blind guides. Blind guides is being charitable. Although to be fair these bishops are simply following like sheep in the path of dhimmitude set for them by the last two popes, Benedict and Francis. Neither of these popes ever did or have done anything to protect the Middle East's Christians from what amounts to genocide, or urged the Western nations to take them in as refugees or protect them in any way. Instead, they're willing to turn a blind eye and participate in the process of bringing in Muslims to America for their own Thirty Pieces of Silver. And this Pope has the nerve to say that Donald Trump is not a Christian? Tell me, who's the real Christian? Who's pledging to defending them and their faith and who's essentially ignoring their terrible plight and selling them out? 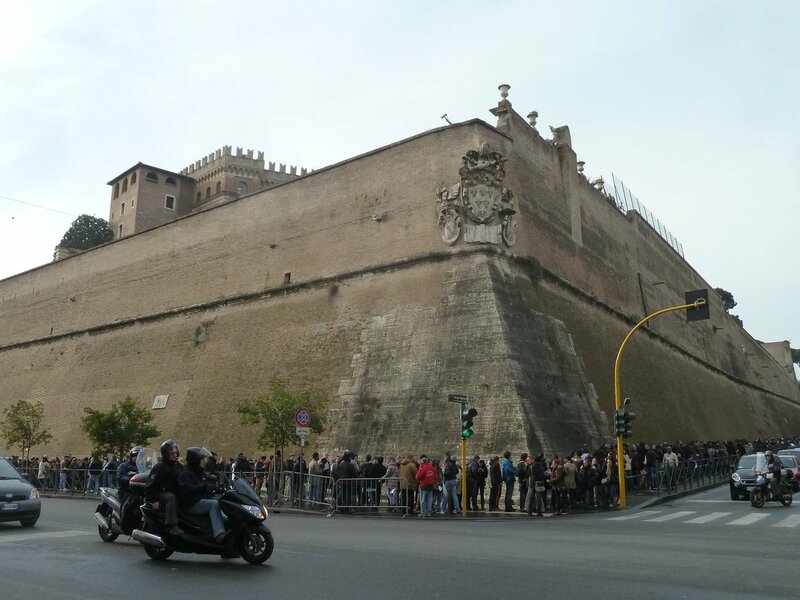 The Vatican, for its part, welcomes millions of visitors a year — but allows only a very select few, who meet strict criteria, to be admitted as residents or citizens. Only about 450 of its 800 or so residents actually hold citizenship, according to a 2012 study by the Library of Congress. That study said citizens are either church cardinals who reside in the Vatican, the Holy See’s diplomats around the world, and those who have to reside in the city because of their jobs, such as the Swiss Guard. Spouses and children who live in the city because of their relationship with citizens — including the Swiss Guard and workers such as the gardener — have also been granted citizenship. But that means few of the Vatican’s citizens are women. A Vatican spokesman did not return an email seeking comment on its policy. Just like most Marxists, Pope Francis is a major hypocrite. I've enjoyed watching you go from virulently anti-Trump to virulently pro-Trump. Well, Anonymous, when facts change, I change my opinion. What do you do? Actually, I wouldn't say I'm virulently anti or pro anyone except for Mrs. Clinton and the Ranting Old Commie, both of whom I'm sure you adore. Not that Bernie will be around too much longer. Since you haunt these pages, I'm sure you've read why. But I admit, Trump is growing on me. And after the experience with Obama,I'm wary of first term Senators who've never run anything, although to be fair, unlike Obama, Marco and Ted at least have held actual jobs before. The best post that I have read on the subject. Living in a sanctuary city, I'm a minute away from asking the priest to my church is he has a green card.